I’m gearing up for my twin’s birthday mid-August. 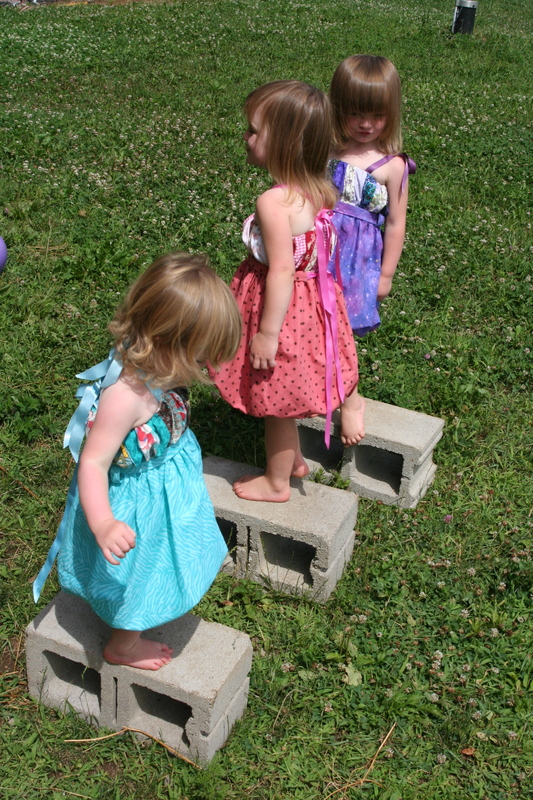 I wanted to make summer birthday dresses for the twins, and one for their little sister now rather than at Christmastime. Since it will be a busy month, I’m trying to work a little ahead this year. I started these in mid-July, and finally got them done two days ago. I saw a cute dress (that I particularly liked the top on) at Me Sew Crazy. I like the hot air balloons on the bottom, but it wasn’t quite what I was going for. I wanted to try a bubble skirt instead. I also like to make clothes wearable for as long as possible- I’m lucky to get all three done while they still fit! So instead of a fixed sized top with a button closure, I did it a bit larger around with elastic to snug for a better adjustable fit. 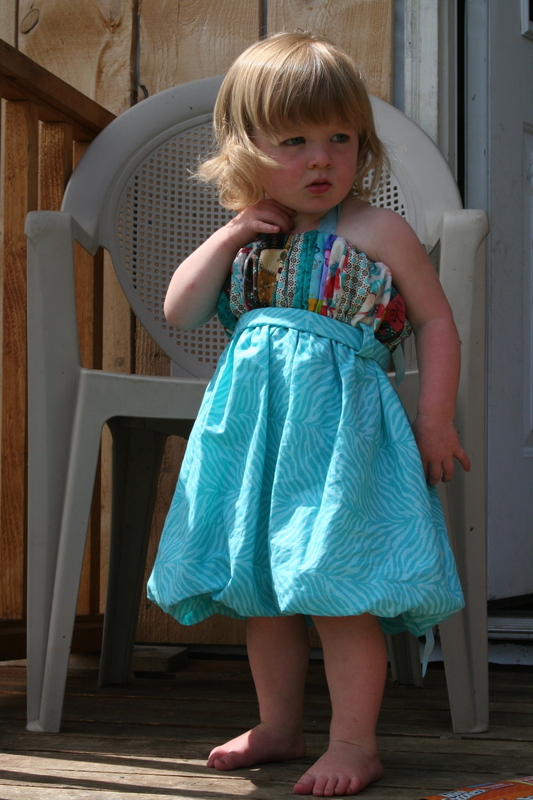 The gathers and bubbling make it a forgiving dress to sew. 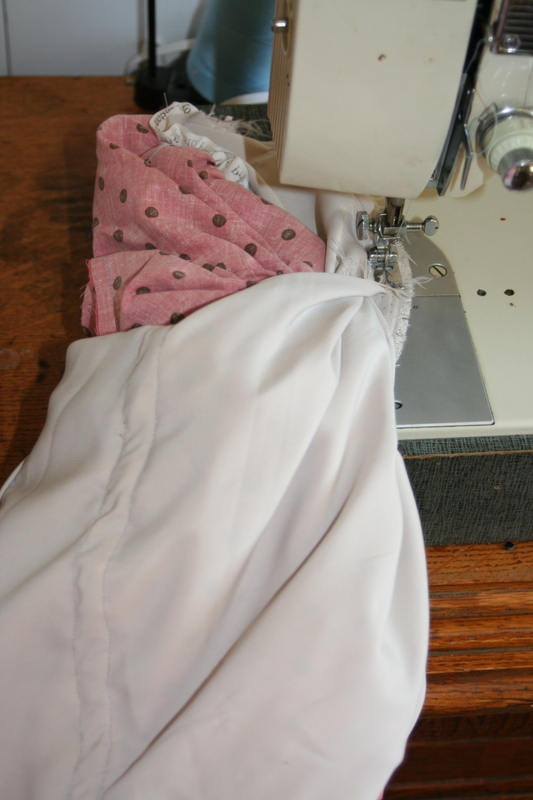 The pieces and assembly are fairly easy, as long as you’re not intimidated by all those seams on gathered fabric. 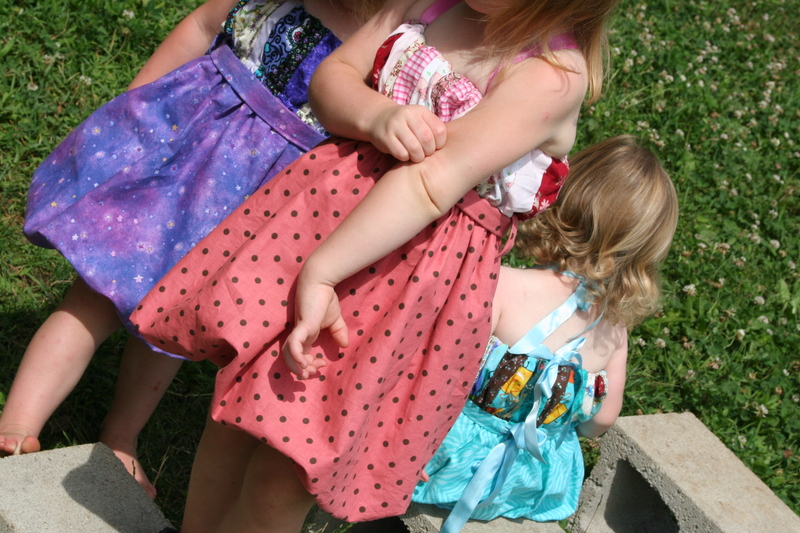 These dresses fit all three of my girls- my 1 1/2 year old and my almost 3 year olds nicely. I think it would fit fine at 12 months, just be a bit longer. 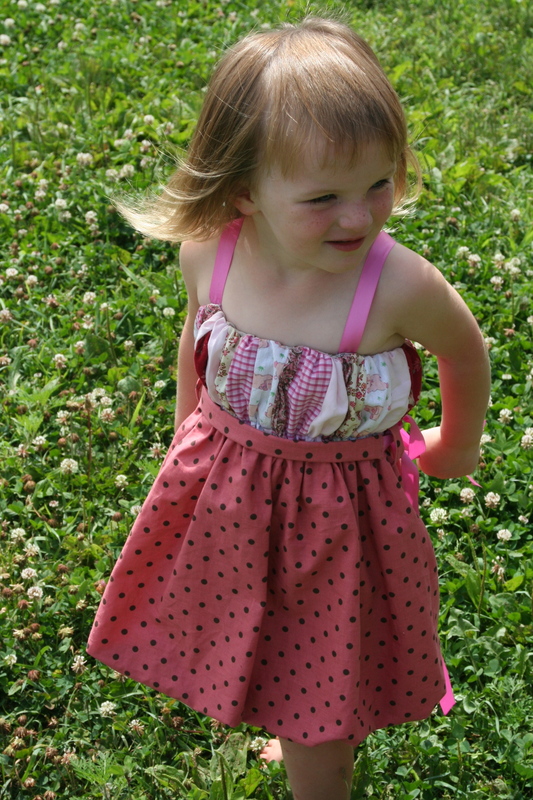 It should also be wear-able as a top through size 4T. My girls currently measure 21″ at the chest, and I expect it should fit well at least through 24″ at the chest. The inner tube is 28″ minus the seam, so for as long as it’s comfortable, my girls will be wearing them. The straps are tied, so they change with the age for fit. 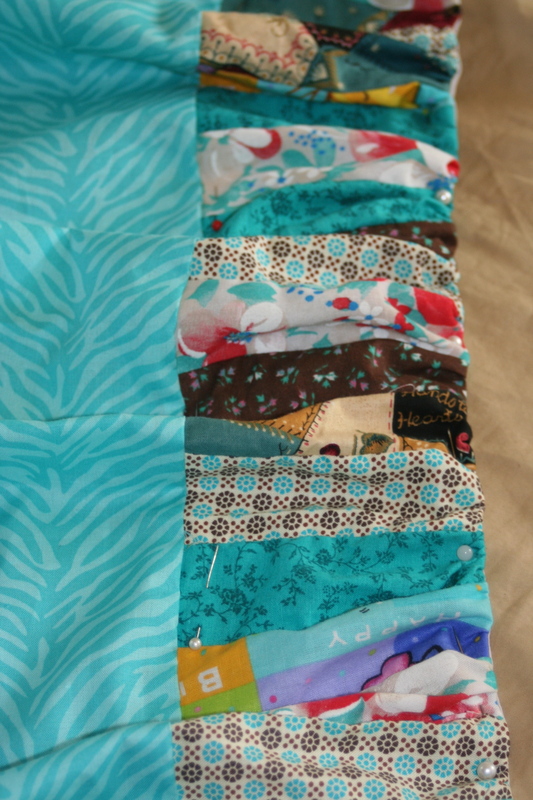 I used 2″x5″ blocks- 5 of each in 6 different fabrics for a total of 30. 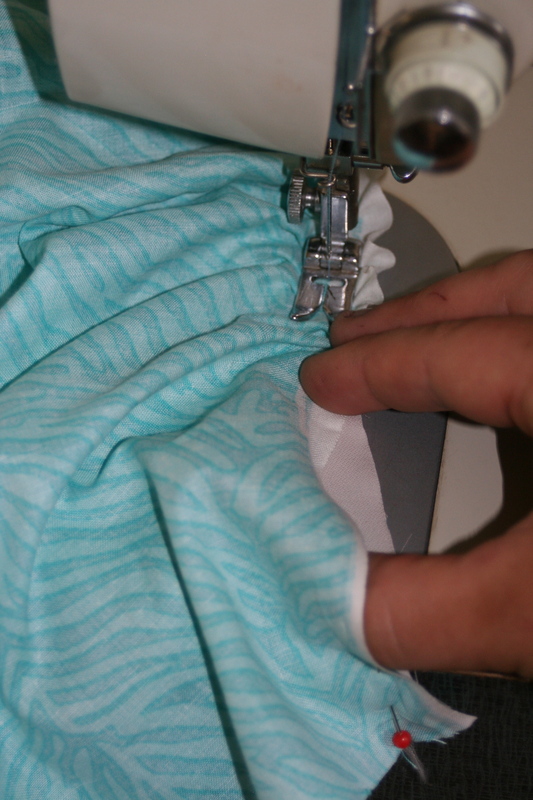 I make small seams, so my finished top strip measured 48″ consistently on all 3 dresses I made. 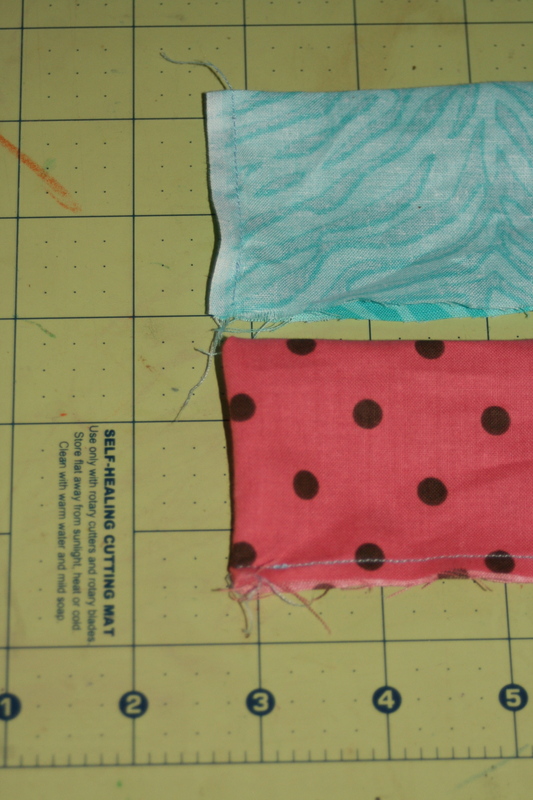 If your seam allowance is bigger, either increase the width of the blocks, or use more blocks. Just make it end up 48″ or you’ll have to make adjustments to the skirt. 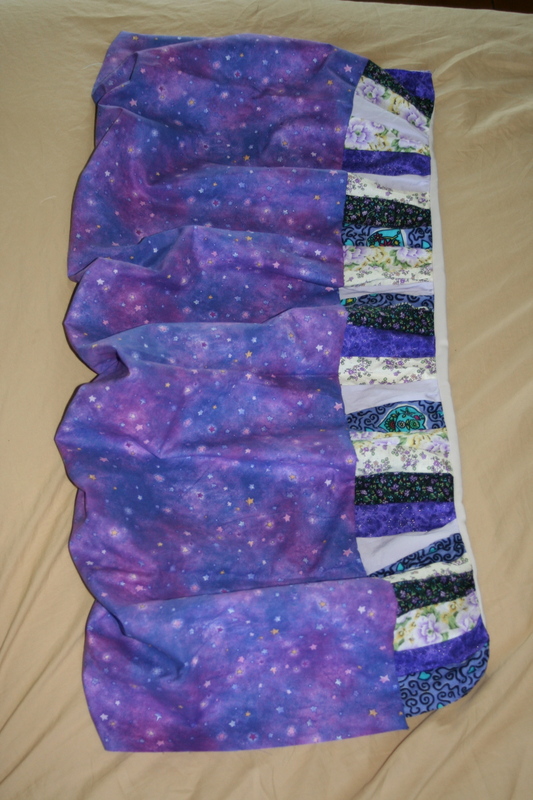 The skirt piece of the dress I cut 48″ long (same length as my pieced top) and 15″ high. My inside tube was all one piece, a rectangle 17″x28″. 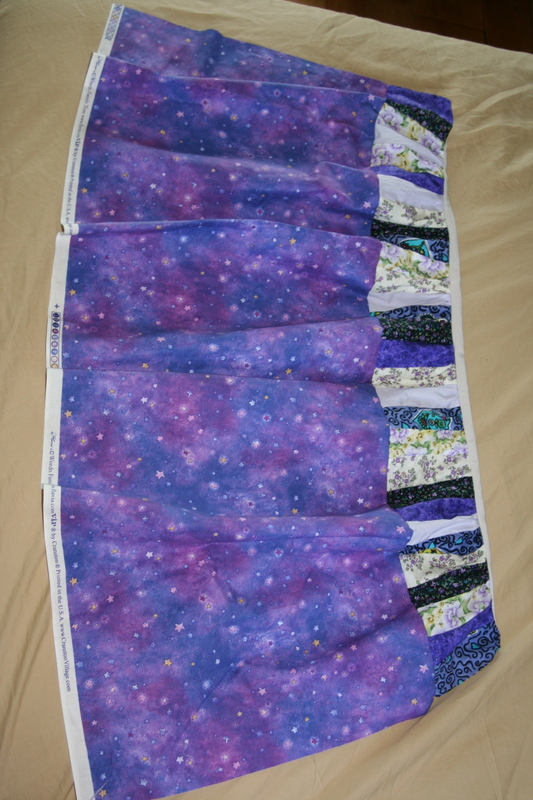 The combined length of the pieced top and the skirt is longer than the tube for the bubble effect in the skirt. 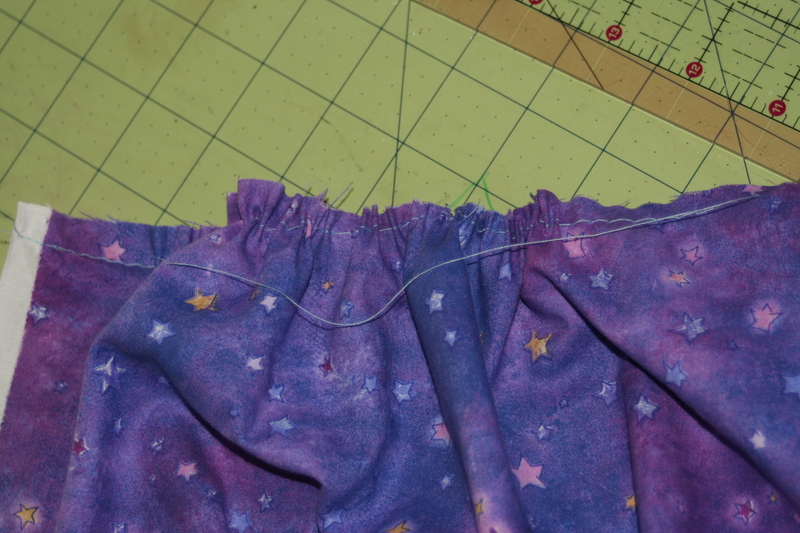 Sew the skirt to the pieced top (right sides together). 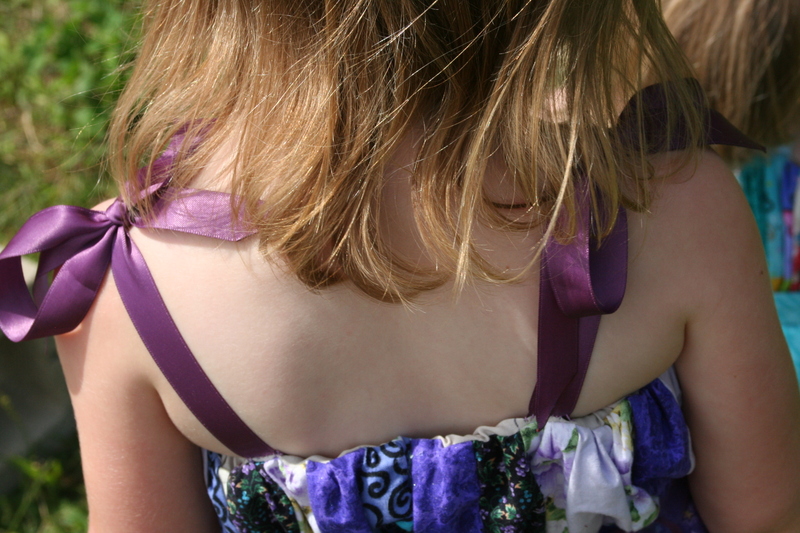 You can add the ribbon for straps here or at the end. If you’re adding them here, stitch to the inner tube piece. I would put the end of the ribbon along the seam of the inner tube and lay the ribbon on the inner tube fabric. Stitch at the edge, then stitch at about 3/4 inch up from the edge (the level where the outside will be stitched to the inside). Just pay attention to make sure they’ll end up coming out of the top seam. Here’s what it would look like if you were laying it out to do the straps that way. The red pin would be the seam line with the gathered fabric when you sew the inner tube to the outside Sewing at the yellow is just extra security to hold the ribbon in place. If this is too complicated or you just want to wait, you can hand stitch them on at the end. (I didn’t sew my straps here. I thought I was going to do the straps a different way then changed my mind, so I added them at the end). Placement for the straps: Mine are at 3″ and 11″ away from the center back seam (add a bit for seam allowance, since it’s not sewn yet). I cut coordinating ribbon to 15″ lengths (4). 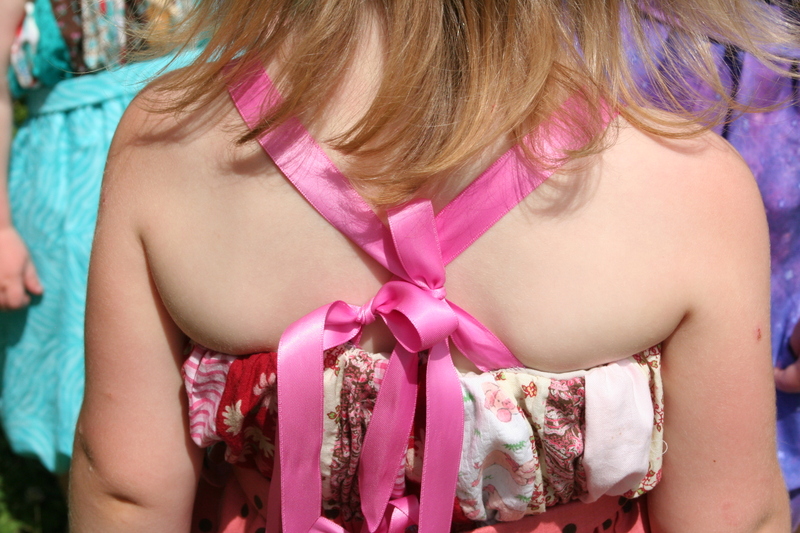 If you just want a halter top, just cut 2 lengths of ribbon and place at 11″ from the back center seam. Here’s what mine look like. 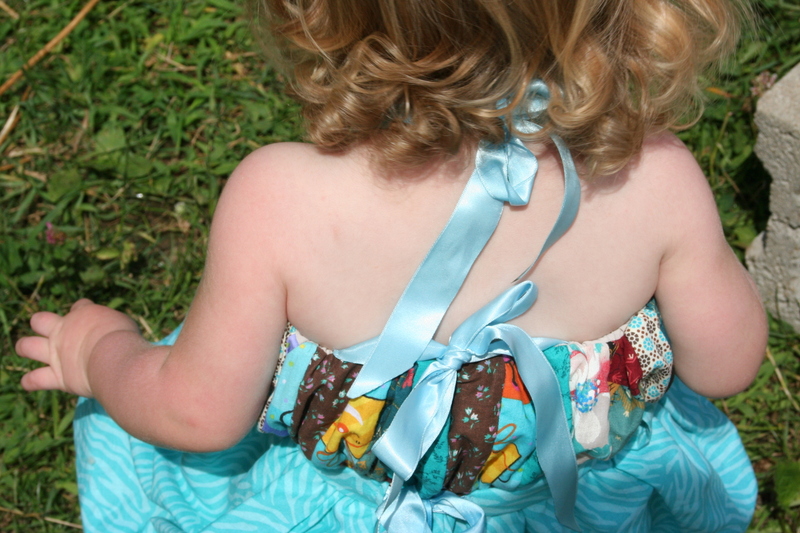 Make sure not to get the outer fabric or the elastic while you stitch the ribbon straps on. Time to gather and sew the outside to the inner tube. I fold to find half way on each and pin together, then repeat in half again, then meter it as I sew for a fairly evenly gathered seam. 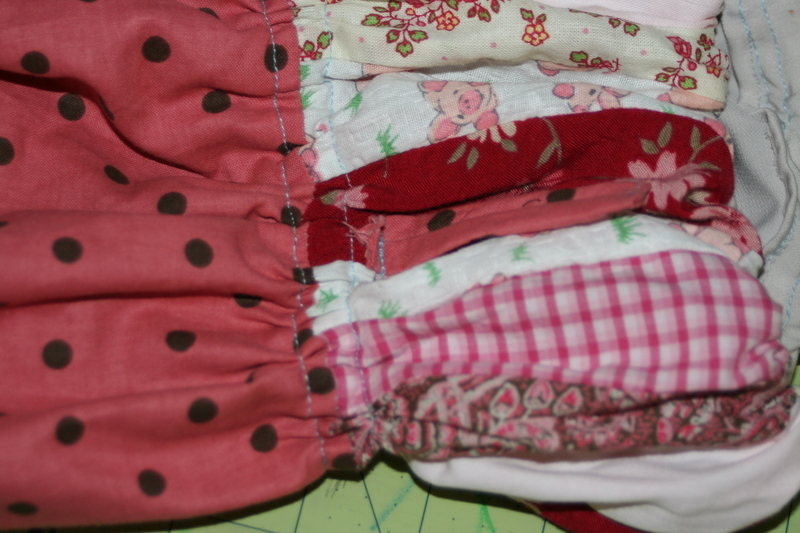 I just sew slowly and push the excess fabric under the foot as I go, making the gathers as even as possible and making sure I use all the fabric by the time I get to the next pin.) Pin at more intervals if you want/ for more fool-proof, even gathering. Make sure the inner tube overlaps 3/4″ or so. 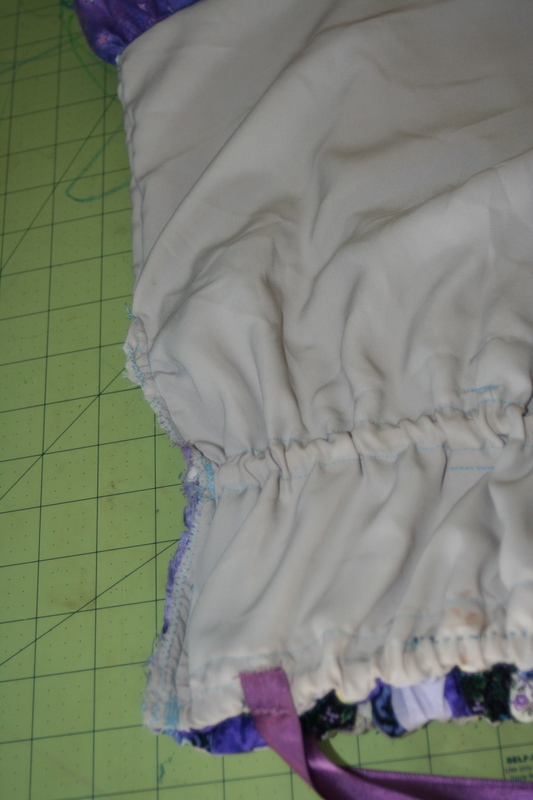 Once you’ve stitched the inside and outside together, you can fold the overlap down and sew the inner tube to itself to keep raw edges from showing. 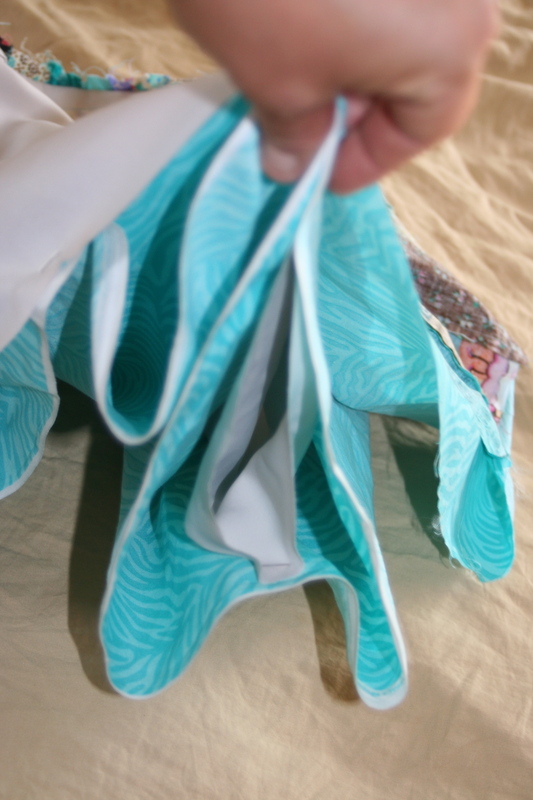 Then, make sure there is a seam no more than 1/2″ down on the inner tube- this is a channel to run elastic in, and you want to make sure it stays snuggly up at the top edge of the dress. Repeat the fold in half to find center and pin procedure for the bottom of the skirt and the inner skirt- right sides together, and sew. (Remember that the outer skirt is longer). Turn right side out and admire the bubble effect. Now pin the top edge. 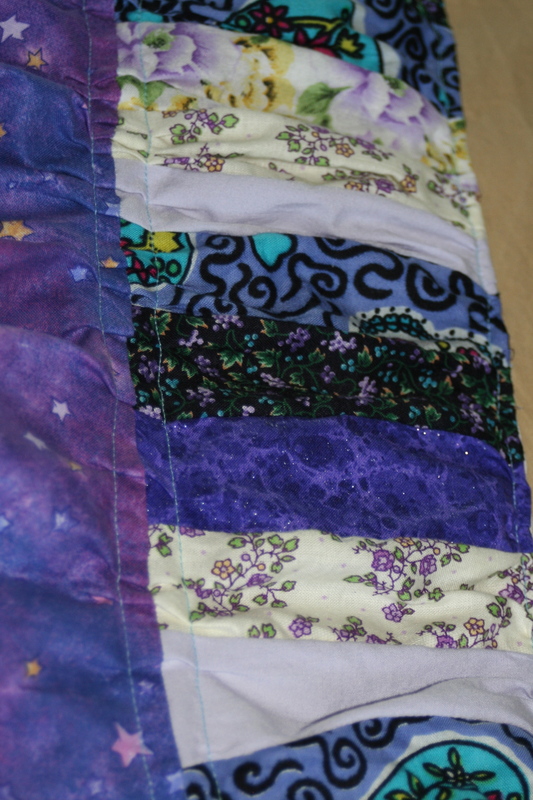 If you want to top stitch, you can, but I like the look without the topstitching better, so I just pinned. Smooth the gathered top over the inner tube and put some pins in at the waist so the gathers don’t shift too much. 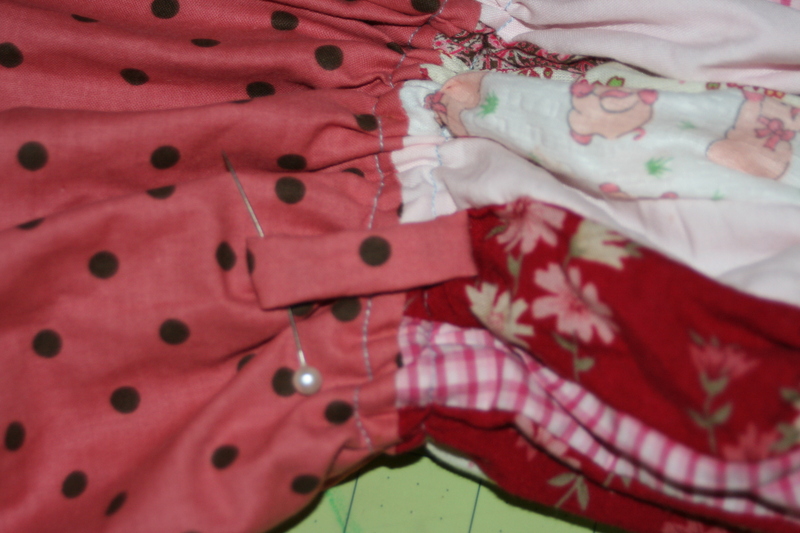 Stitch the inside and outside together just above the skirt/top seam, then again just below it. This makes the second channel for elastic. Sew on the belt loops here for an easier time of it. If you sew them later, it’s tougher, but do-able. 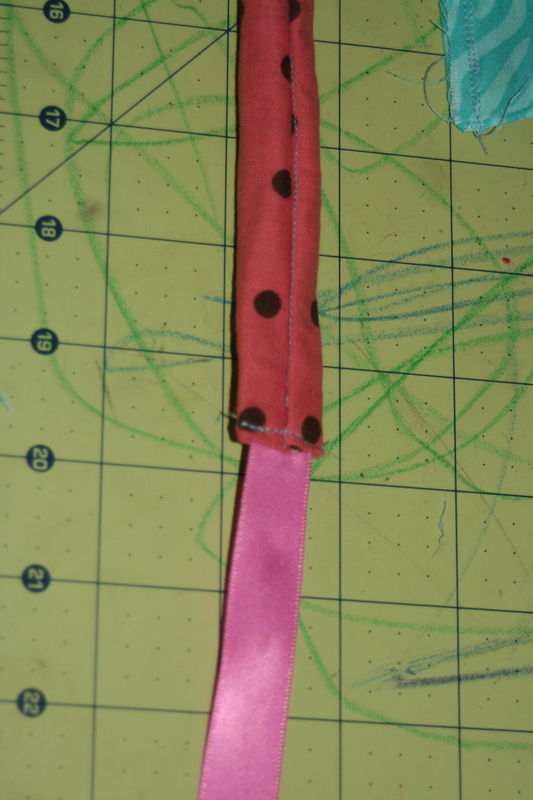 For belt loops, I cut one piece of skirt fabric 1 1/2″x6″. 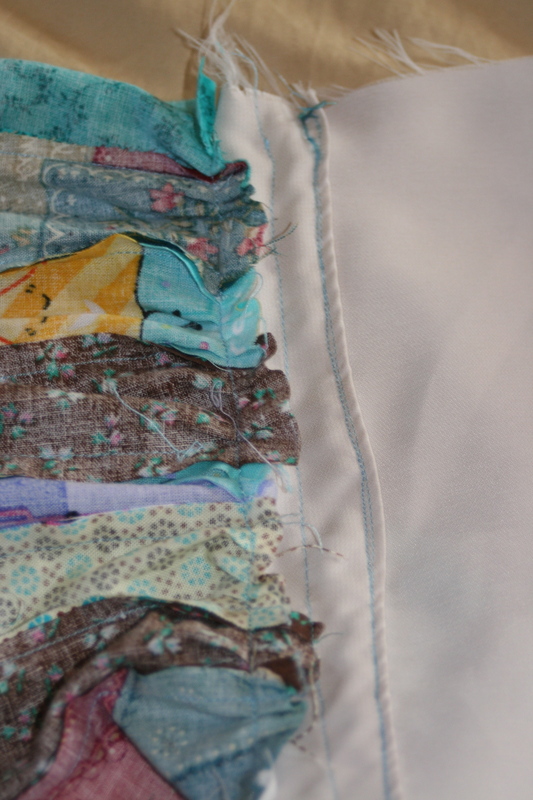 Sew down the long side, right sides together. Turn the tube inside out and cut in half (one for each belt loop). Fold raw edges under and stitch closed. 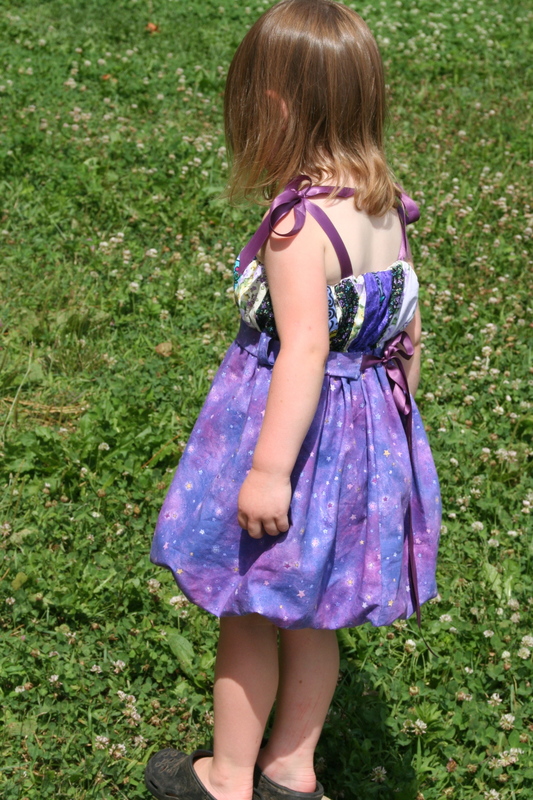 Sew onto dress at sides (half way around the tube- at 7″ from the back seam). 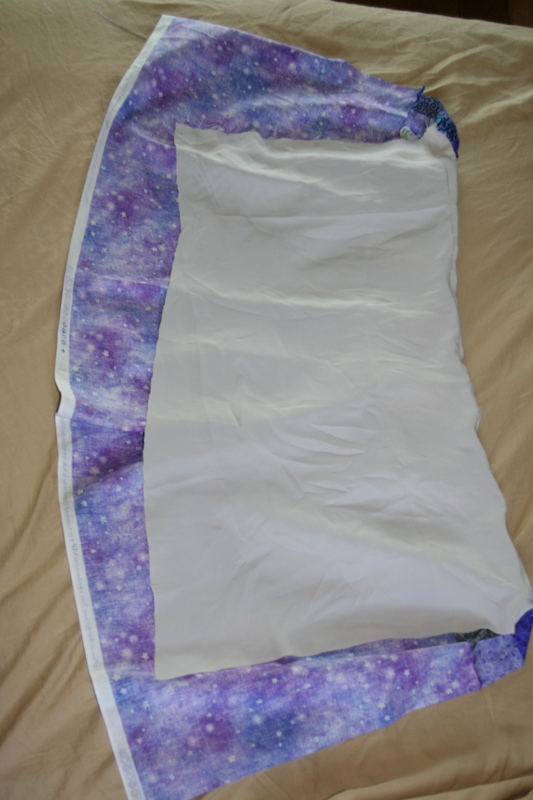 I sewed the top edge first then folded down to sew the bottom edge and hide the seams. It may be easier to hand sew if you don’t like machine sewing in tight spots. 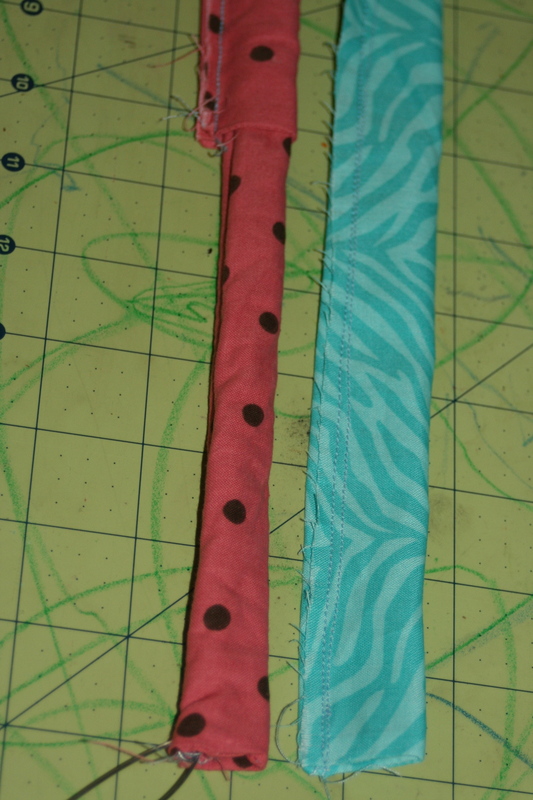 Cut two pieces of 1/4″ elastic 18 inches long and pull through the two channels. Stitch the ends of the elastic. Line up the skirt/top seam on both sides at the back; sew the outer layer of the skirt together, (right sides together) and continue this seam onto the inner skirt for as long as you can. Then line up the back seam again, and sew down the back to the skirt/top seam (through both layers) and then just on the inner tube layer. Zig-zag stitch the raw edge for a cleaner finish. Now onto the belt. I cut 1/2″ ribbon from the dollar store into a 60″ piece and slant cut and melted the ends with a candle. (You can use fray check as well). Then I cut a piece of the skirt fabric 4 1/2″ x 18″ (could be as short as 14″ and still have the fabric show across the front half of the dress). Put right sides together and sew ends. Turn inside out (it makes a pouch). Baste the edge of the pouch closed. Fold in half and sew, turn inside out. 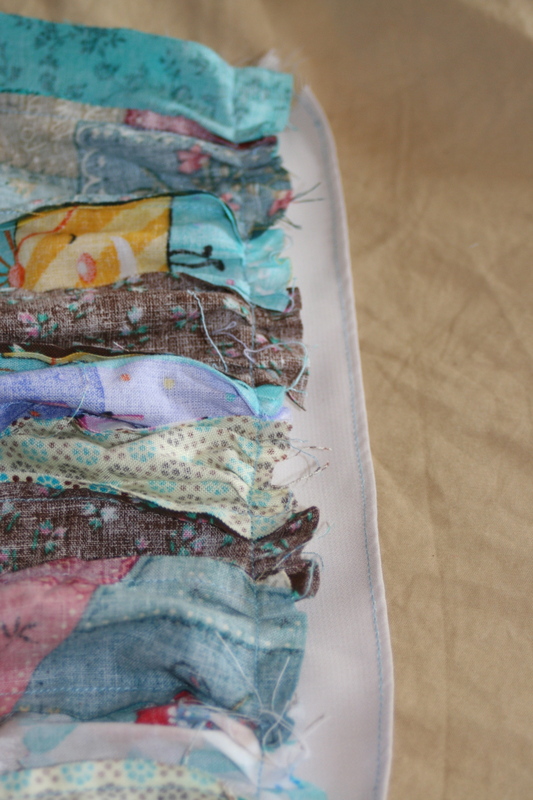 Slide the ribbon through and center the fabric portion of the belt on the ribbon. 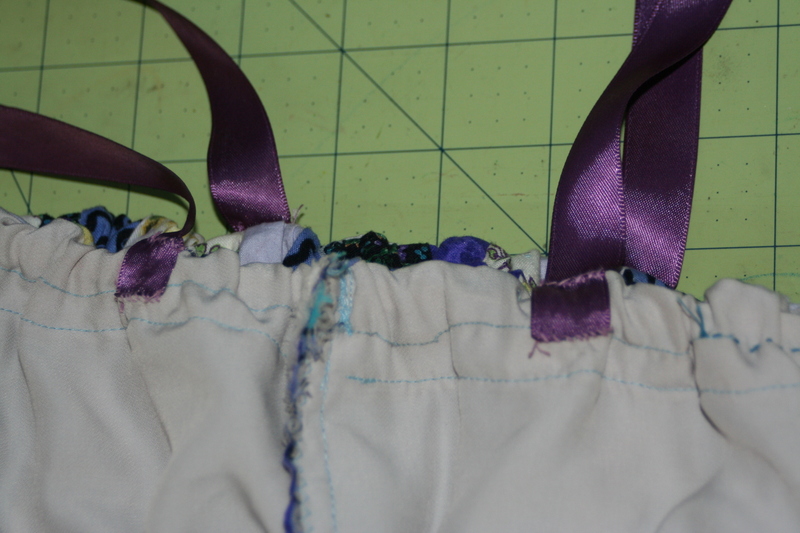 I prefer to also center the seam at the backside of the belt. 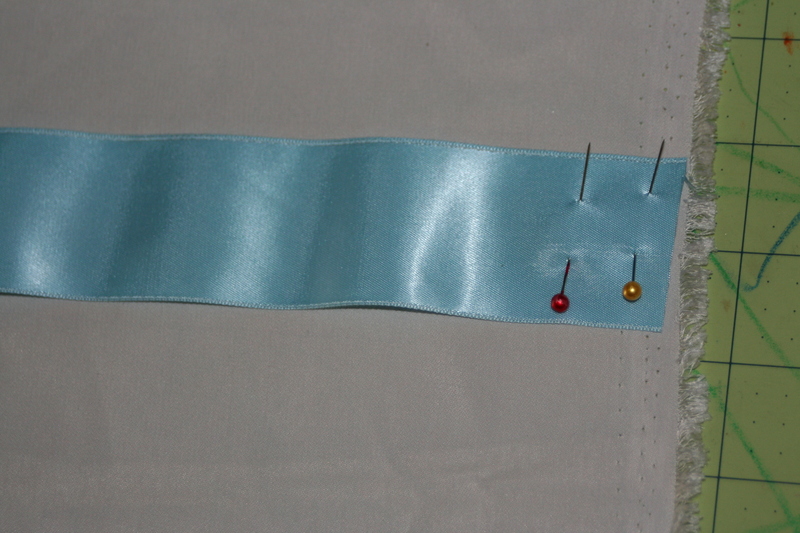 Then sew the fabric to the ribbon at the ends. Now, PUT THEM AWAY UNTIL THE BIRTHDAY PARTY SO THEY DON’T GET STAINED!!!!! These are quick and easy and delicious! Not a dill, sweet, or bread and butter, they have a taste of their own. No cooking, no canning, no heating anything. Perfect to do on a hot day with the abundant cukes from the garden. This recipe is from my husband’s mom. Mix sugar, vinegar, salt, and spices together. Do NOT heat, this is a cold syrup. Prepare your jars. The original recipe says 3- 3 pound peanut butter jars. I used a gallon jar and 2 quarts. Divide the onion evenly amongst your containers. 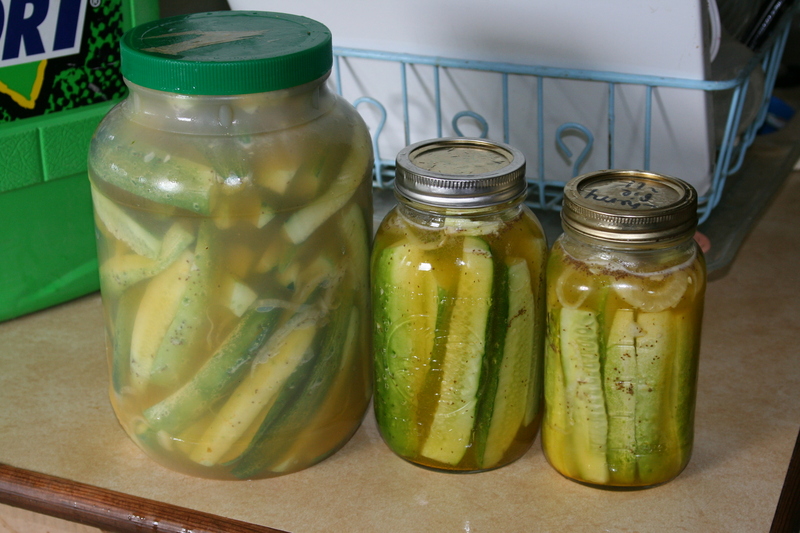 Add cucumbers to each jar to fill. Cover with syrup (mix well!) and put on the lids. Refrigerate at least 5 days before using. They’ll keep in the fridge forever, just get stronger flavored. We had some make it almost 2 years in a no-cucumber year. I’m not sure how they lasted that long, as usually they’re eaten up in a hurry! Our supply usually makes it about 9 months and we have to go without until we get more fresh cukes. I’ve finally gotten some Recipes posted. Many of these are from MOPS creative activities or extra days. Recipes added today include: Homemade popsicles, Apple Enchiladas, Calzones/Stromboli, No cook noodle lasagna, Easy Chicken divine, Stuffed Shells for 20 pans, Seasoned Rice and Grains mix, Strawberry Jam-N-Can, Honey Chip Granola Bars, Basic Cheeseball, Peanut butter fruit dip, and Smoothies. I’ve been feeding hog feed and scraps in the am and scratch grains/whole corn from the crock pot in the evenings. I’m moving the pig tractor about once a day. I’d been soaking the scratch grains/corn in HOT water for 24 hours, but wasn’t getting as good of digestion as I’d hoped- lots of grains still coming through unused. So now I use a crock pot on high for a couple hours between feeding and bedtime, then sitting off until the next day (or if I forget to get out fresh grain to throw in the crackpot, on low overnight, then sitting till evening feeding). I think it’s been working much better for me, although it takes a bit of electricity. I’ll mention a crazy idea, just in case someone else wants to give it a try. 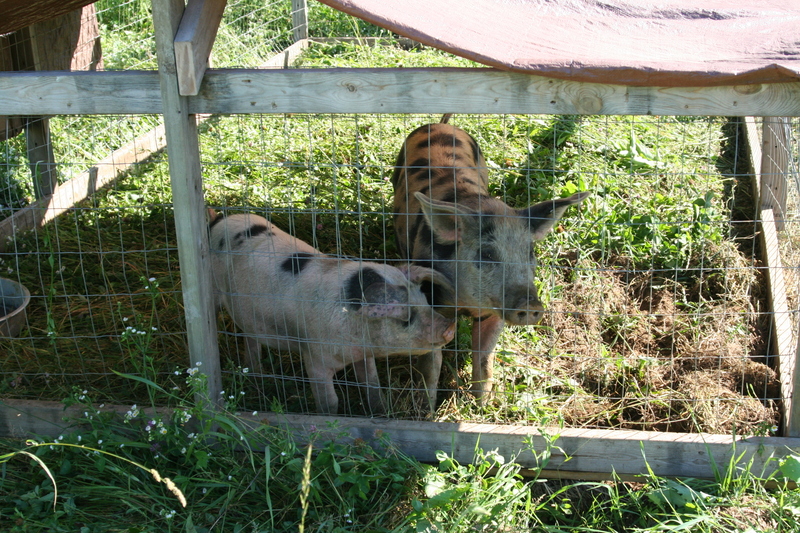 I contemplated the idea of raising some meat rabbits to feed the pigs. I don’t think we’d eat rabbit much, but if I were going to keep pigs year round, I’d consider it still. IF I did, I’d probably not feed raw, although I believe I could. Mentally, I don’t like the idea as much, and the possible issue of disease transmission is greater then. It would be a bit more work, but I’d probably throw the killed rabbit in it’s entirety (skin, fur, bones, entrails, blood) in a pot of water and cook it OUTSIDE (very well to soften the bones) and feed. I don’t have room to plan on much extra for milk or eggs to feed pigs, but could probably squeeze in space for a few forage based rabbits to raise in the nicer weather and just overwinter a couple of breeding pairs. On the other hand, it might completely gross me out. If you’ve done it or ever give it a try, let me know! 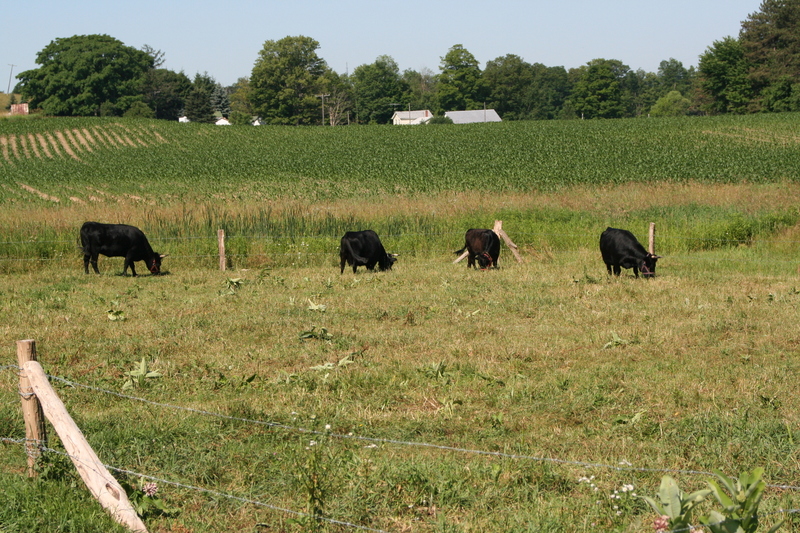 The 3 year old dexters (Norma and Lannie) returned from a visit with the neighbors bull. They are actually a bit more approachable now than when they left, which surprised me. Hopefully they’ll continue to settle in and decide I’m not a bad milk maid. I took a picture of all 4 of my dexter girls this morning and found it amazing how big that calf has gotten. If it wasn’t for the horns, they’d be much harder to tell apart. More progress has been made on our chicken coop and garden. John has been putting the touches only a finish carpenter can on the chicken coop. He has trimmed out the doors and windows to match the house (all 2 windows we have trimmed there…). He’s also finished the cupola for venting. It looks very nice, I think. But it’s taken a lot longer than necessary for chickens! He looks out the door and can enjoy it, though. If it looked like a thrown together mess, it would bother him a lot! Good thing I didn’t build it myself. 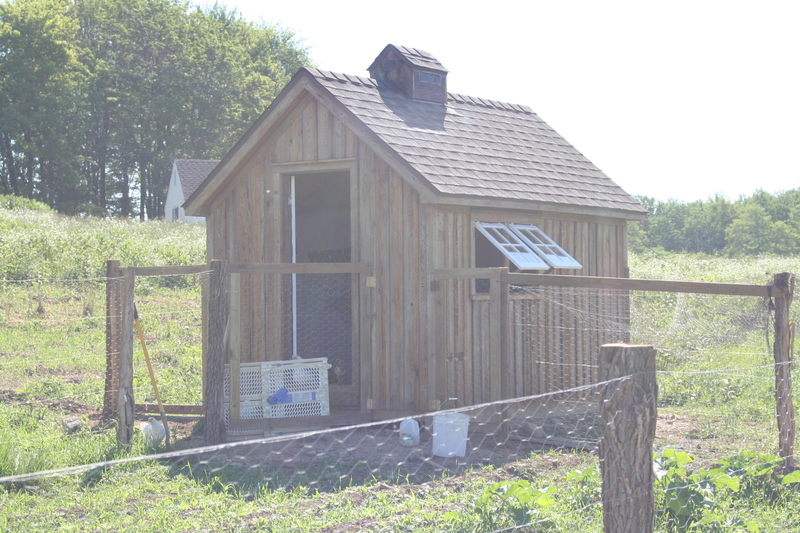 The coop is 8×12 with a 3.5×8 garden shed in the back and a 8.5×8 chicken section in the front. It still will gain a window in the left hand side and eventually some insulation and a little electric for a lights and a couple outlets. To review: Our plan was to enclose a garden/chicken run. 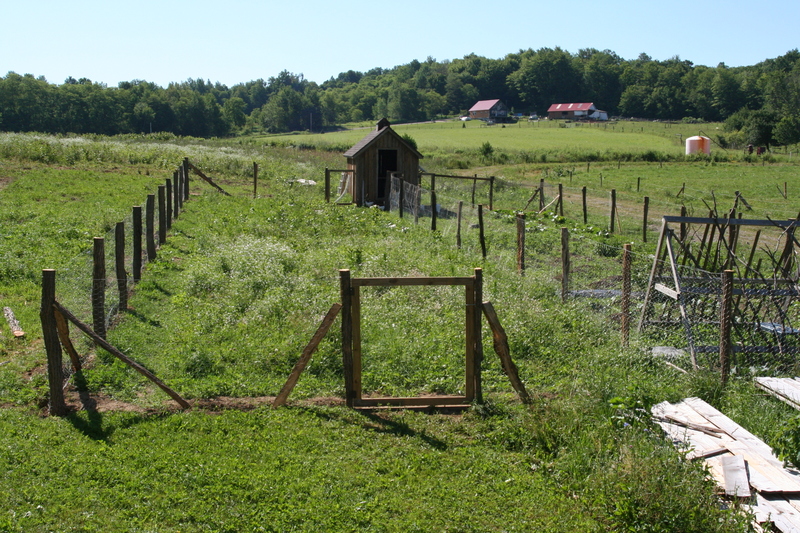 It’s split in half, so that each year the chickens get one side for a run and we get one side for a garden. We’ve pretty much completed the project. A little dirt to fill in the trench where the chicken wire runs into the ground and the “panel” that can be opened to let in a tractor to till each year needs to be attached. I let the chickens out in their side of the enclosure this morning to attack the weeds that have grown so well in there! 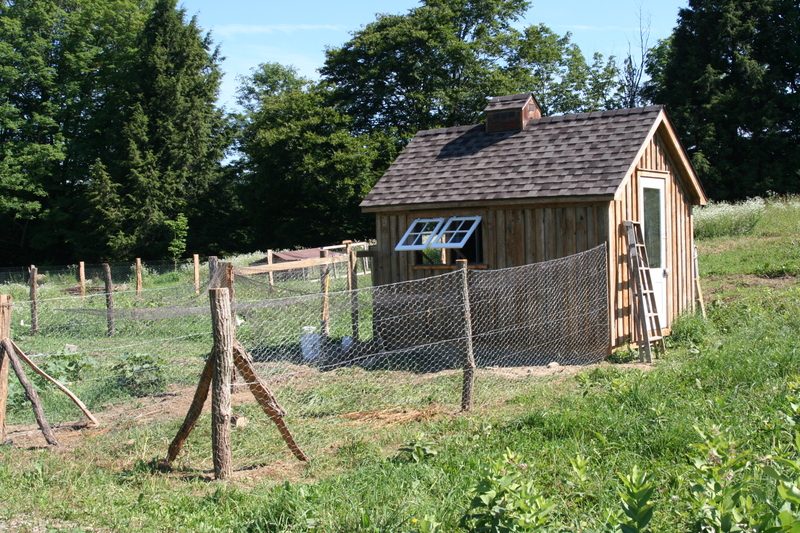 There’s also a small run off of the coop that will be fully enclosed for a most always accessible but secure chicken run. Their favorite weed seems to be milkweed. Weird. I though it was mildly poisonous, but they’ve been eating it with abandon and choosing it to eat first for the past several weeks and have been doing fine. The first rooster (my “pink” chick) attempted his crowing yesterday morning. He’s the big one in the first picture. I am suspicious that several more are roosters- they have a deeper red tone to their combs and around their eyes. 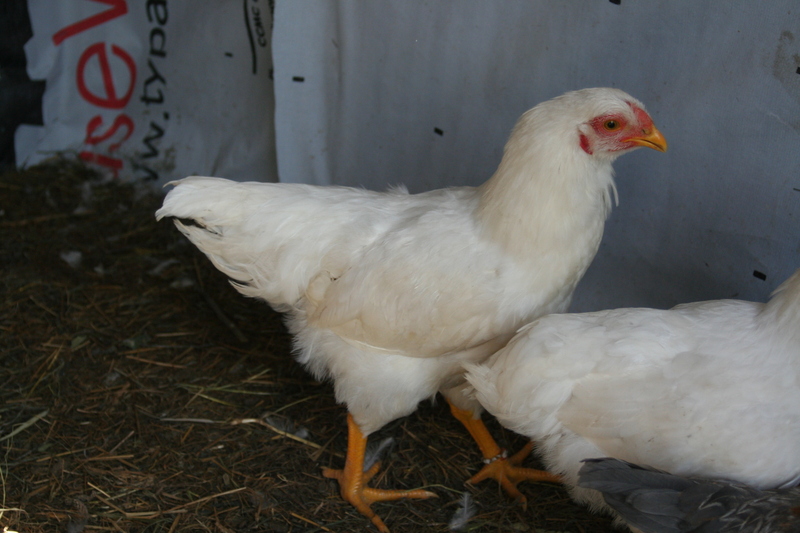 They seem to be larger as well, and one (“red” chick has small wattles now- need to check and see if that’s to Chantecler standards). I haven’t tried too hard to count how many MIGHT also be roosters, because it’s still hard for me to tell and I don’t want to know how many expensive chicken dinners I’ll be having yet. I am also pretty sure that two of the 4 ameraucanas are roosters- both with red feathers flecking their bodies. The ones that are clearest in the photos here I think are both female. The tiniest one I’ve named “Sparrow” as that what she reminds me of, both for her brownish coloring, her size, and her strong, constant chirping! No one else has official names yet. Just colors. I’m still amazed at the size differences from “Sparrow” to my “pink” rooster. My mom helped me to bring the girls out to pick cherries last Friday (I don’t know what I’d do without her!) We went to Olde Chautauqua Farms and picked 101 pounds between the two of us. We had the dubious distinction of being the largest quantity non-amish pickers so far this year! 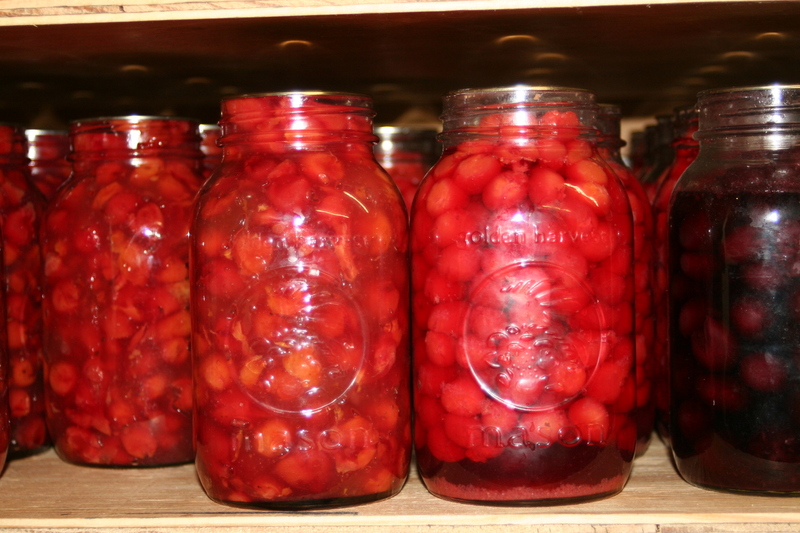 For my house, that meant a bucket of sweets for eating and the rest in sours for canning- about 74 lbs of cherries total. After picking there last year, we pitted all the cherries with paperclips (they don’t have pitting service, but they’re a lot cheaper and it’s much quieter to pick there than the big cherry place a few miles away). That prompted me to look around and invest in a pitter. I found one on ebay last summer for a very good price and even got an apple peeler/slicer/corer for “free” with it. It’s an old cast iron “Mt Joy” pitter- a crank style with a plunger to push out the pits. It took a little bit of practice to figure out it’s features. If you have one you haven’t used yet, or are thinking about getting one, maybe this will be helpful info. It will plunge out the pit (usually), then the skewered cherry lifts up with the plunger and is knocked off the plunger at the top of it’s cycle. It falls off the plunger into your awaiting bowl (usually). Originally, these had a leather gasket. I made one from a plastic milk jug and one from a piece of vinyl, but next year I think I’ll look harder for a scrap of leather to make one out of. These did’t hold shape well where the plunger goes down through. 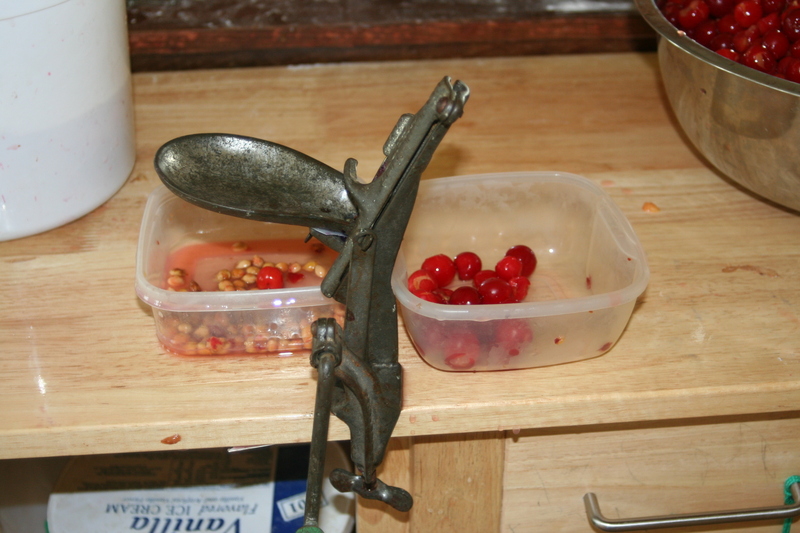 When the gasket doesn’t hold it’s shape, a small cherry can get mushed into the pitting hole and get stuck there rather than lifting back up. It WILL plunge out the pit without the gasket, but the pit often won’t detach from the flesh of the cherry without it (even a poor gasket like the ones I tried helped considerably). A loose-fleshed larger cherry can easily hide a pit if it’s just pushed to the side rather than down by the plunger. The hopper isn’t very big (but better than doing them one at a time like a hand pitter!) and keeping them rolling down to the plunger is a constant job. I finally (after 3 canner loads- 2 plain cherries that I didn’t notice the pits, and one cherry pie filling that was riddled with pits from the mixing involved) figured out I still had a lot of pits. So I sat on a chair and watched for the pits to fall out underneath. It saved my feet from standing, too. Don’t know why I didn’t try it sooner! I took a bit longer, but I got MOST of the pits that way. At least any pits I canned were whole, not fragments like you can get from the big mechanical pitters a the fields. End tally for me: 14 quarts plain sour cherries, 18 quarts cherry pie filling, and a couple cups of pie filling that we partially used over french toast. Plus several pounds of sweets that we’ve been eating fresh. 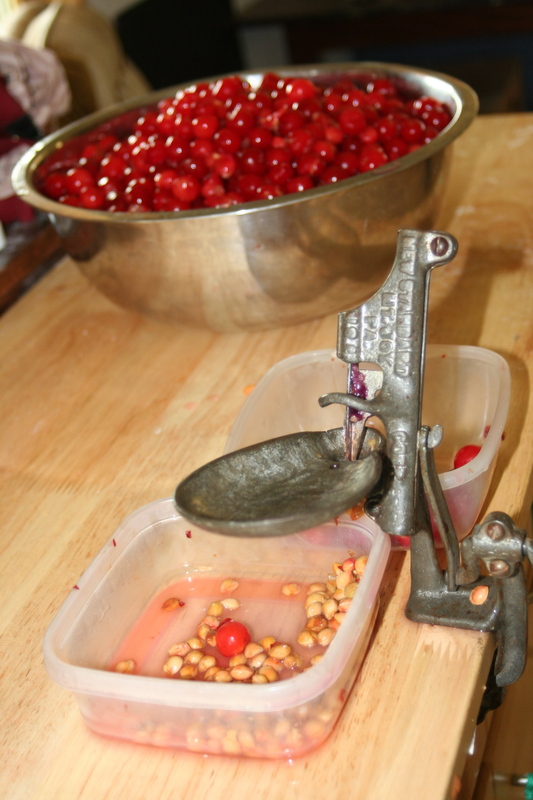 This shows the pie filling (left) and regular cherries (right). There will be bubbles throughout the jar of pie filling. For canned pie filling, I used my favorite pie recipe, but with clearjel rather than cornstarch (which isn’t supposed to be used in canning). It’s from Taste of Home and compared very closely to the pie filling recipes in my “Putting Food By” book, it just doesn’t contain any lemon juice. 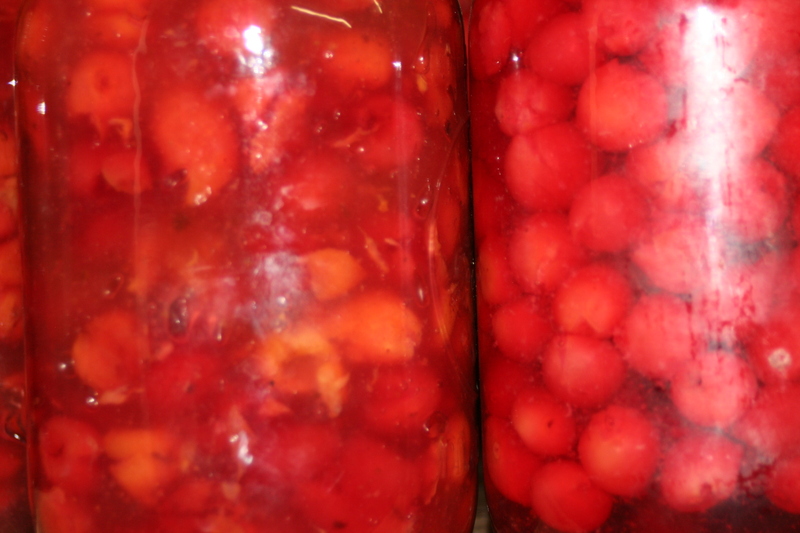 I know lemon juice is added sometimes to ensure a safe pH for hot water bath canning, but I don’t believe that cherries are anywhere close to borderline, and as the added ingredients shouldn’t be affecting the pH much either, I didn’t add any to my recipe. Combine juice and cornstarch in a saucepan, whisk in, then stir in sugar. Heat and stir until thickened/jelled. Remove from heat. stir in nutmeg, cinnamon, and almond. Add paste to cherries and mix well. For one canner load (7 quarts) this is what I used. A few ingredients are decreased. Follow directions for 1 pie, but use a really big bowl or pot! Spoon hot filling into jars, run a spatula around in the jar to decrease big air bubbles and top off jars as needed. Process for 30 minutes. After getting all those cherries canned, I convinced John to let me buy a few re-usable canning lids from Tattler (reusablecanninglids.com). My lid supply is low, so I’ll have to be buying some before too long, anyhow, and the regular lids just keep getting more expensive! They had a discount code for orders placed through July 4th that I was able to take advantage of (you can find discount codes when available on their Facebook page). I’ve only been able to find basically positive reviews for them so far, so my expectations are high. They are more expensive, but if I re-use them half a dozen times, they will pay for themselves, then savings from then on out. For what it’s worth, they’re also BPA free. I honestly haven’t explored that much in our household, but it’s a benefit. I’ll have to update once I get them in the mail and try them.